Poets: A.E. Housman. Adam Zagajewski. Agha Shahid Ali. Billy Collins. Billy Collins exercise. Snorri's Edda. Carl Dennis. Clark Strand (haiku and essays). Corey Marks. Franz Wright. Gary Young. The Gawain Poet. J. Zimmerman. J. Zimmerman (haiku). J. Zimmerman (tanka). J.D. McClatchy. Jack Gilbert. Jane Hirshfield. Jorie Graham. Karen Braucher. Kay Ryan. Kay Ryan's style. Kay Ryan The Best Of It: New and Selected Poems. Laureate Poets: Britain; USA. Len Anderson. Li-Young Lee. Linda Pastan. Margaret Atwood. Mary Oliver. May Sarton. Nordic Skalds. Philip Larkin. Pulitzer Poetry Prize (U.S.A). 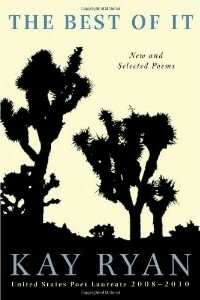 The Best of It: New and Selected Poems (2010). The Jam Jar Lifeboat and Other Novelties Exposed (2008). Dragon Acts to Dragon Ends (1983). and The Best American Poetry: 1995 (guest editor Richard Howard) with "Outsider Art". Kay Ryan's Stanford reading (2010) from The Best Of It: New and Selected Poems. With illustrations by Carl Dern. Edited by Marie Dern and Jane Downs. 15 poems, each a "response to a randomly selected entry in Ripley's Believe It or Not!. One of her two best books as of its publication. Winner: Ruth Lilly Poetry Prize. Runner-up: Best Book of Contemporary Poetry Prize for CPR (Contemporary Poetry Review). Have a similar number of lines to the earlier poems, with less variety in the number of lines. Have a similar number of sentences per poem, with significantly less variety in the number of sentences. Have significantly fewer words per line. Reprinted in The Best American Poetry 2005. Reprinted in The Pushcart Prize XXIX (2005). Her best book as of its publication. again against always among anything attention baby behind big birds boats cannot catch coming day deferred does donkey doubt down drops earth eat even ever far feeling fishes get go green grows happen hard hope horses imagine inside kashmir know left less life light little look love matter mind native nor nothing old once part pennies people places plate pocket resist right rust sailors say see sense set shift should silence small something sometimes spring star states stick sun surface tailor takes test things think though thoughts time toward turns two upon vanish verbs want warps water weakness whole work. Reprinted in The Best American Poetry 1999. This is the transitional book from tremendously good work to great work. See further comments at Kay Ryan's style. Reprinted in The Best American Poetry 1995. Published by Copper Beech Press. Finalist for the Lamont Book Award. Finalist for the Lenore Marshall Poetry Prize. 52 pages of poems (with 7 pages of overhead for sections). So, averages 17 pages per section, making each about	chapbook size. Slightly fewer lines, with less variety in the number of lines. Slightly fewer sentences per poem, with less variety in the number of sentences. Have slightly fewer words per line. Library Journal reviewed Flamingo Watching as "not recommended" because they felt that "Ryan's cramped syllabics have a monotonous density that too often mistakes sound for sense...these poems are derivative and lacking in substance." The first publicly available book by Ryan. Shows attributes that will continue to shine for decades in her work. Kay Ryan makes it all fresh again with her highly original vision, her elegant, quirky craft. I would like to hear the poems read aloud, as she has a wonderful ear - delightful and dancy. These poems look easy, but the deeper one delves, the more they astonish and nourish. The cover is a black and white photo of David Smith's Twenty-four Greek Ys (1950), a painted forged-steel sculpture in the NYC Museum of Modern Art. Its title phrase appears (apparently independently) within "The Tablets" (p.27). The short spine of the sculpture echoes the short spine of most of Ryan's poems. Each irregular group of Greek Ys is somewhat like one of Ryan's varied-length lines. Each Greek Y raises its arms or its leg in a quirky dance the way Ryan's words don't simply sit on the page but move and interact. Some of the words point left and some point right; some are erect and some are inverted; some are straight-legged and some have a small kink to a knee like a can-can dancer. Privately printed (paid by friends) in California. Published Dragon Acts to Dragon Ends. Awarded a 2001 fellowship from the National Endowment for the Arts. The Ruth Lilly Poetry Prize (worth $100,000). Awarded a 2004 Guggenheim Fellowship. Elected a chancellor of the Academy of American Poets. edited by Joseph Parisi and Kathleen Welton. Published The Jam Jar Lifeboat and Other Novelties Exposed. Appointed for a second term as U.S.A. poet laureate. Published The Best of It: New and Selected Poems. All poems Copyright © 1985-2015 by Kay Ryan.